It took a bloated set of onstage performances over a 2-day period in Hawaii, but we now know all there is to know about Qualcomm’s new Snapdragon 845. The basics here are that it provides a boost in some key areas, like battery life, performance, connectivity, imaging, and…AI! If you don’t launch a product and talk about AI for 75% of it, you have done it all wrong, my friends. 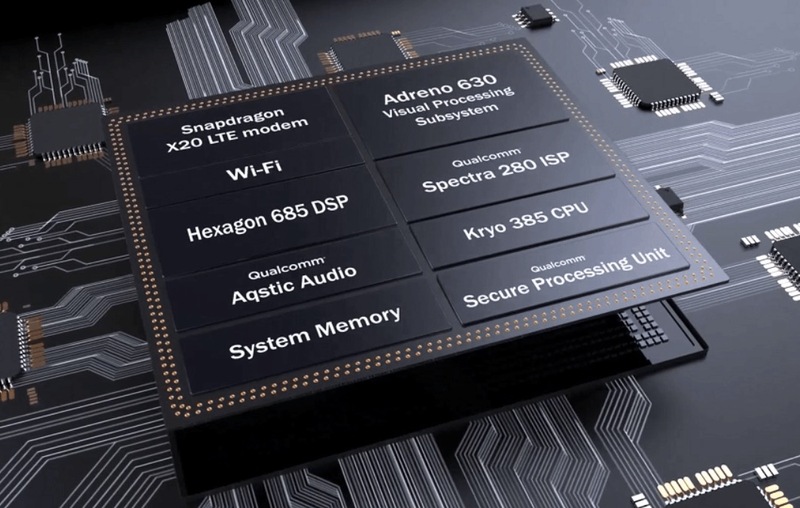 In the connectivity realm, the Snapdragon 845 will pair up with Qualcomm’s new X20 LTE modem, which is a Gigabit LTE solution. We’re talking about the same X20 that’s in the 835, so that’ll mean theoretic download speeds of up to 1.2Gbps, 5x carrier aggregation, License Assisted Access (LAA), 4×4 MIMO, and all of the other wireless goods you’ll need as we move from upgraded LTE to 5G. Of course, this wouldn’t be a Snapdragon announcement without talking about cameras. So we’ve got those previously mentioned Spectra 280 ISP and Adreno 630 GPU chips included. Qualcomm wants you to know that these will help capture 64x more high-dynamic range color info in video and for playback on all of your Ultra HD Premium displays. That’ll include 10-bit color depth and Rec. 2020 gamut. Other features that make the list are 16MP stills at 60 images per second and 720p video at up to 480fps. That Adreno 630 will bring the fire in Extended Reality (XR) situations too, which is a cheesy way of describing VR and AR experiences. The Snapdragon 845 enables “room-scale 6 degrees of freedom (6DoF) with simultaneous localization and mapping (SLAM) – for features such as wall-collision detection.” So it’ll help you not bust your face when hella deep in some VR goodness. As for the AI stuff (Hexagon 685 DSP), look, it’s a 2017 press release and product unveiling, so we’ve got mentions of 3x improvement in AI performance, more natural voice interactions, (hopefully) faster always-on voice detection, and that sort of thing. Basically, that’s Qualcomm saying that you should use Google Assistant more and that it should be faster to launch and do stuff for you. As you probably figured, the Snapdragon 845 is sampling to customers (manufacturers) and will land in devices in “early 2018.” We’re expecting phones like the Galaxy S9 and whatever the next phone from LG is to have this processor on board.